We are looking at kanji with a kozatohen, keeping in mind that each may have originated from three different meanings and, possibly, shapes. Ochiai (2014) gave two different original shapes of a kozatohen in which the three triangles were placed differently – one with a horizontal line at the top (for a “ladder”), and the other with a peak of each of three triangles being in the center if you look at them sideways (for “mountains; hills”). He said that these two shapes converged into one. We have also seen the third meaning, “a stack of soil raised high.” Over the last couple of weeks as I looked at these three different shapes and meanings, they started to mingle together and the lines among them became blurred in my mind. A ladder suggests something “high.” A ladder could be flights of dirt stairs. An undulating line of mountains or hills suggests ground that is high and low. Hills are mounds of soil, etc. Keeping all these – a ladder, stairs, mountains/hills, high ground- in mind – we move on to look at more kanji. For the kanji 阪, the left side of the bronze ware style, in green, would be a good candidate for the interpretation “hills placed vertically.” It gave the meaning that is something to do with soil. The right side 反 is a familiar shape in many kanji, such as 反阪坂返板叛版, all of which have the sound /ha’n/ or /he’n/, and form semantic-phonetic composite kanji. Let us look at the kanji 反 first. The Kanji 反: In the Key to Kanji I explained that it was “a hand pushing back a piece of cloth, indicating ‘to push back, to roll back or to reverse.’” The Kadokawa dictionary, Kanjigen and Shin-Kangorin (2011) all take this view. The history of the kanji 反 is shown on the right. Now looking at the earlier shapes in oracle bone style, in brown, and bronze ware style, I wonder if the upper left shape really looks like a hanging cloth. Usually the upper left (厂), a bushu gandare in kanji, is viewed as a “cliff.” If we take it as a “cliff,” what does “a hand under or against a cliff” mean? Shirakawa’s explanation is that putting hands against a sacred area to climb in was sacrilege or disrespect, thus it meant “against.” I need to see more examples for this view to make sense. So, in the mean time, I just leave my explanation in the book as it is. The kun-yomi /saka’/ is in 大阪 (“Osaka city; the minor prefecture (府) of Osaka” /oosaka/) and 大阪弁 (“Osaka dialect” /oosakaben/). The on-yomi /ha’n/ is in 阪神地方 (“Osaka and Kobe area” /ha’nshin-chi’hoo/). The kanji 坂 “slope”: In Japanese for the kanji that means “slope” we use the kanji 坂, with a bushu tsuchihen (土) “soil.” The kanji 坂 is newer kanji and was not included in Setsumon Kaiji. But, interestingly, Akai (2010) gave the bronze ware style sample shown on the right. (I do not know from which source this shape was taken.) It had a cliff with a slight bulge in the middle for an emphasis, soil (土) at the bottom, and a hand (又) on the right side. The image may be a person trying to climb a cliff putting his hands against it. For the kanji 陳, the two bronze ware style samples on the left had a kozatohen. and what would become the kanji 東, which originally meant “a bag of stuff or dirt tied at both ends.” (We are coming back to this in a second.) In the first bronze ware style sample, the shape on the far right was a bushu bokuzukuri (攵) “to do; cause an action”( from a hand moving a stick.) In the second sample, the bottom was “soil” (土). Together they meant displaying bags of stuff or soil tied on the both ends. From this meaning we interpret the kozatohen in this kanji to mean a stack of dirt (– unless we take the view that bags of soil were placed in front of the divine ladder). There is no kun-yomi in the Joyo kanji. The on-yomi /chi’n/ is in 陳列棚 (“display shelf” /chinretsu’dana/), 陳述 (“statement; declaration” /chinjutu/), 陳情する (“to make representation against or for; lodge a petition” /chinjoo-suru/), 陳腐な (“stale; ready-made phrase”/chi’npuna). The kanji 東: Taking the explanation given in Setsumon 2000 years ago, the kanji 東 has often been explained as the sun coming through a tree, thus “east.” But now with abundant samples in oracle bone and bronze ware style scholars generally agree that it was a bag of stuff that was tied on two ends. The three lines at the top and the bottom were the ends of a tied rope. The meaning “east” for 東 was a borrowing. When used as a component the original meaning was retained, as is always the case in bushu. The meaning of “a bag of heavy stuff that was tied on both ends” was in the origin of many other kanji such as 重 “heavy,” 動 “to move” and 童 “child,” just to name a few. I hope to have a chance to look at ancient writing samples for those kanji in the near future. The next two kanji 陛 and 階 have been discussed in the earlier post [The Kanji 人仁従縦比皆階陛 – Posture (3) on March 28, 2015] in connection with “person,” In this post we look at 陛 and 階 as the examples of a kozatohen to mean “steps; stairs.” In 陛, the right side had 比 “people standing in a row” and 土 “ground.” The subjects were standing in neatly formed rows in front of the stairs that lead to where the emperor was. The kanji 陛 is used only to refer to the royal head of a state. For sample words, please refer to the earlier post. The kozatohen in the kanji 階 really signified exactly the same meaning as the kanji 陛. The origin of the shape, whether “soil stacked up high” or a “ladder,” gave the meaning of having different levels within. Flights of a staircase or steps to walk up were a good match for a kozatohen. The kanji 階 had 皆 “many; everybody,” which was used phonetically for /ka’i/. A kozatohen gave the meaning “stairs; gradation; story” to the kanji 階. We are seeing a clear-cut illustration of the important fact about a bushu and tsukuri (the right side of kanji) in kanji here – A bushu gives meaning and a tsukuri gives sound. There is no kun-yomi. The on-yomi /i’n/ is in 病院 (“hospital” /byooin/), 入院する (“to become hospitalized” /nyuuin-suru/), 医院 (“physician’s private practice office” /i’in/), 上院 (“the Upper House; the Senate” /jooin/) and 下院 (“the Lower House; the House of Representatives” /kain/) and 大学院 (“graduate school” /daigaku’in/). This entry was posted in Kanji Radicals, 漢字の成り立ち and tagged こざとへん, the kanji 皆, the kanji 阪, the kanji 陛, the kanji 院, the kanji 陳, the kanji 階, the kanji 反, the kanji 坂, the kanji 完, the kanji 東, the kanji 比. In continuing the bushu 力 “power; strength”, we are going to look at the kanji 動 and 働 in this post. In the two kanji 動 and 働, the obvious starting point is the kanji 重. 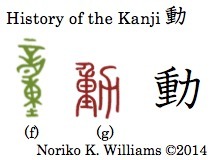 When we look at ancient writing, discussing the kanji 重 further takes us to the kanji 東. The kanji 東 is the kanji that we study at a very early stage (we need it for 東京 “Tokyo” /tookyoo/!). Your teacher tried very hard to make kanji meaningful to the class and may have said something like, “Can you see the sun, 日, inside a tree, 木, in this kanji? Morning sun shines through the branches of a tree in the east. 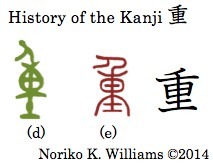 So, the kanji 東 means ‘east.’” Forty years ago, when I first started to teach Japanese and looked for a way to explain kanji, I also came across this explanation. Even then I felt doubtful about it. Apparently that was the explanation given in the Setsumon Kaiji, the utmost authoritative etymology source of Chinese characters. So, it has been retold timelessly. The ancient writings tell us a different story. In oracle bone style, (a) in brown, and bronze ware style, (b) in green, it was a bag that was tied around a pole, with two ends tied tightly and the middle wrapped around as well. The middles of these samples do not look anything like the sun. At the time of the oracle bone style and bronze ware style, shown on the right, the sun was a circle with a dot, long or short, in the middle, that signified that the inside was not empty. It was only in ten style, (c) in red, when the middle dot became a line across. What did a bag of stuff with a pole going through have to do with the direction “east”? The answer is, “Nothing.” The writing was borrowed to mean “east.” Borrowing means it had no relevance to the meaning or sound of the original kanji. Borrowing a shape for a direction was not uncommon: the kanji 西 “west,” from a basket, 南 “south,” from a musical instrument, were borrowed. The kanji 北, “back to back,” was used phonetically for “north.” This was just the ground work for the kanji in this post. The kun-yomi 東 /higashi/ means “east.” Another kun-yomi /a’zuma/ also meant “east.” The on-yomi /to’o/ is in 東京, 東海道 (“the Tokaido road” /tooka’idoo/) and 東北地方 (“northeast region” /toohokuchi’hoo/), 中東 (“Middle East” /chuutoo/). The kun-yomi is in 重い (“heavy” /omoi/), 重たい (“heavy” /omotai/), and 重み (“weight” /omomi/). Another kun-yomi 重ねる (“to pile; lay something on the other” /kasaneru/), 重ね重ね (“repeatedly” /kasanega’sane/). The on-yomi /ju’u/ is in 二重 (“double” /nijuu/), 厳重に (“closely; strictly” /genjuuni/). In the kanji 動, the left side 重 was just explained. If we jump to the ten style, (g), we see what we expect from the kanji 重, with the plough for 力 “power” on the right side. Together they meant applying power to move heavy stuff, or “to move.” So far it makes sense, doesn’t it. But what about the bronze ware style, as in (f)? It had a large tattoo needle (辛) with a big handle, and an eye underneath at the top. (f) in bronze ware style was different from (d), 重 in bronze ware style. Why is that? Even though the ten style, (e) for 重 and (g) for 動, are closely similar, why are the bronze ware styles from which they developed so different? What a bother…, but we will not give up. There is a reason. Ancient creators of writing used a tattoo needle in various kanji. The bushu 言 and 音 that we saw earlier were just a few of the examples. Another example of use of a tattoo needle was that a convict was tattooed as a punishment for a crime. Now back to our kanji 動. The kanji 動 originally meant “to work hard” or “physical work.” The writing was later taken away to mean “to move” or “to move stuff,” which is the current use. The kun-yomi 動く (“to move” ugo’ku/) is 身動きできない (“cannot budge; cramped” /miu’goki deki’nai/), 動き回る (“to move about” /ugokimawa’ru/). The on-yomi /do’o/ is in 運動 (“exercise” /undoo/), 活動 (“activity” /katsudoo/) and 自動ドア (“automatic door” /jidoodo’a/). What happened to the original meaning of “working hard” that 動 had? That is where the newer kanji 働 comes in. 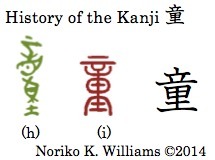 The kanji 働 was created in Japan to mean “to work (using one’s body).” So, there is no ancient writing existed. Logically a kokuji (国字), a kanji that was created in Japan, does not have an on-yomi. But the kanji 働 just took the on-yomi of the kanji 動 /do’o/. The kun-yomi /hataraku/ means “to work for wages” and is in ただ働き (“work without pay” /tadaba’taraki/). The on-yomi /do’o/ is in 労働 (“labor” /roodoo/) and 稼働する (“(machine is) in operation” /kadoo-suru/). This entry was posted in Japanese Writing, kanji etymology, Kanji Radicals, 漢字の成り立ち and tagged the kanji 童, the kanji 重, the kanji 働, the kanji 動, the kanji 東.